If you’re tired of the burnt coffee that your regular machine keeps serving you then it may be time to get one with a thermal carafe. The options and features can get overwhelming though once you start comparing models. 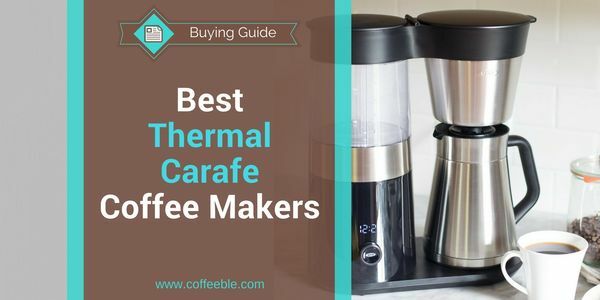 If you’re looking to buy the best thermal carafe coffee maker for the money then make sure you cover these bases. Drink #coffee while it's fresh and only keeping it hot through insulation, not reheating! Do You Want Control Or Convenience? 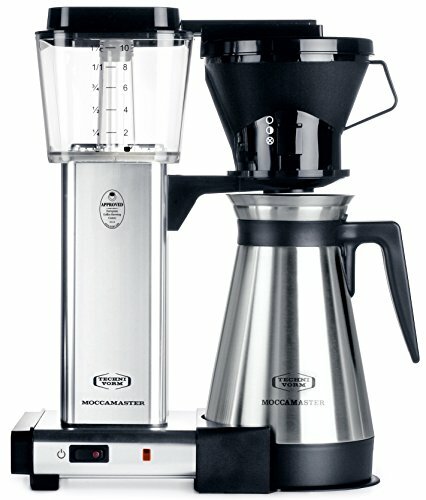 Grinder - Built-In Or Separate? With a glass insulated coffee carafe, you rely on the heating plate to keep the coffee hot. 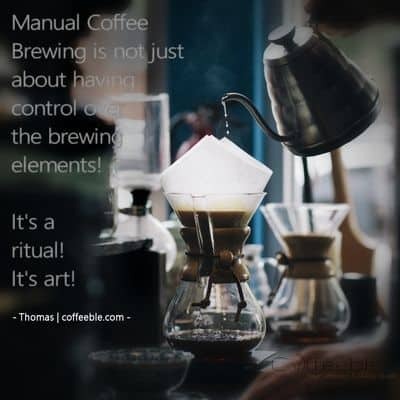 If you drink the coffee straight after brewing then that’s not a problem. If you pour yourself a cup an hour later you’ll be drinking, burnt, bitter coffee. A thermal carafe gets around this problem. The insulated design keeps the coffee hot without needing to be heated time and again. The coffee goes in hot and stays hot. Besides the temperature retention, there are some other things to consider. Insulated thermal carafes are generally made from double volume stainless steel but some are glass lined. Some people claim that the stainless steel affects the taste of the coffee and insist on a glass lining. That’s all fine and well until you knock or drop your carafe one day. Bye-bye glass. Stainless steel lined carafes will last you a lot longer. The quality of your brew has a lot to do with the temperature of your water. 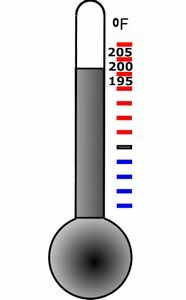 The ideal brewin﻿g temperature range is around 195 - 205 degrees Fahrenheit. 200 deg (95C) is the perfect temperature you want to be aiming for. Make sure the machine you choose can reach, and maintain, this temperature range consistently. Thermal coffee machines normally state their capacity in how many cups it can brew and store in the carafe. Don’t automatically assume that bigger is better. Consider how many cups you’re going to want from a single brew and choose one in this range. A machine with single brew capability is a good bet if you just want a quick cup without doing a full brew. A good thermal coffee machine is not defined by how many buttons and dials it has. If you wake up with a song in your heart and a desire to perfect your cup of coffee then get a machine with loads of adjustable features. If, like me, you tend to communicate in monosyllables in the morning then get a ﻿﻿﻿machine with a single button press to get the brew going. Or even better, a programmable one that will have your coffee waiting for you when you wake up. I’m more of a press button, get coffee person in the morning. The quality of your grinder will have a significant impact on your coffee. The convenience of having a coffee machine with a built-in grinder is great but only if the grinder does a good job. If you’re particular about grind control then you’re probably better off with a separate grinder. 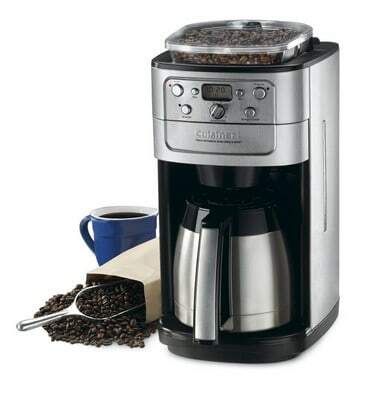 If you intend using the programmable auto-on function to get coffee brewing before you wake up then it’s a good idea to get a machine with a built-in grinder. Leaving ground coffee in the machine overnight is not going to give you the best results. Coffee aficionados will tell you (loudly sometimes) that the pour-over method makes a better cup of coffee than you’ll get from a simple drip coffee machine. When you get it right, that is. Pour-over gives you more control and allows you to wet the grounds for the coffee to bloom and degas before brewing with periodic addition of water. The top-end coffee makers will have some clever electronic control built-in that reproduces this process for you. If you’re the kind of person that measures brewing time on your stopwatch or if the words “dissolution” and “diffusion” mean anything to you then make sure you get one of these bad boys. Make sure you get one that keeps the water as hot as it needs to be for the entire brewing process. Some cheaper machines end up sprinkling water over the grounds that isn’t hot enough and you end up with weak coffee due to under extraction. The Specialty Coffee Association of America sounds like an elitist club of coffee snobs because, well, it is. They know their coffee though and if a coffee machine makes it onto their Certified Home Brewer Program  then you know it’s going to give you a decent cup of coffee. Look out for this certification if you’re happy to spend more money to get something really good. The SCAA tagline is: “Because great coffee doesn’t just happen”. 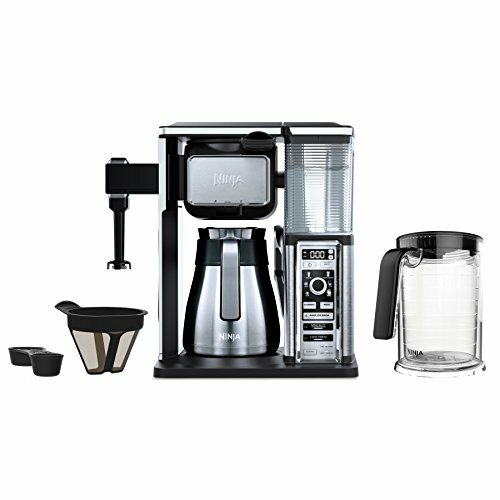 If you subscribe to that way of thinking then instead of leaving it to chance, make sure you get one of these great coffee machines that I’ve reviewed below. Stainless Steel Carafe holds 10 cups of hot coffee and keeps it warm for hours. Heavy duty plastic filter cone and lid are BPA Free and top rack dishwasher safe. 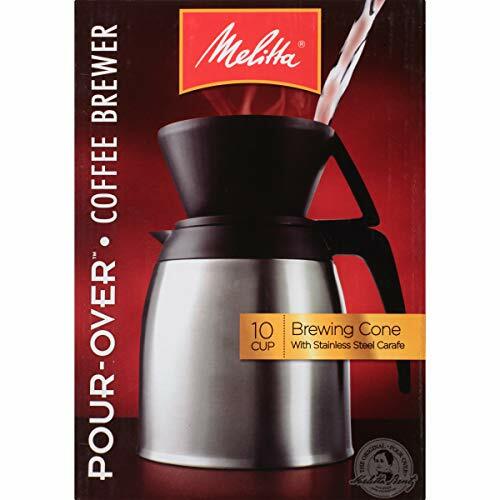 Includes brewing cone, plastic top, and a start up supply of Melitta #4 cone filters. Great coffee for the price! Open filter cone so no chance of forgetting to discard old grounds and discovering a fungus farm a week later. 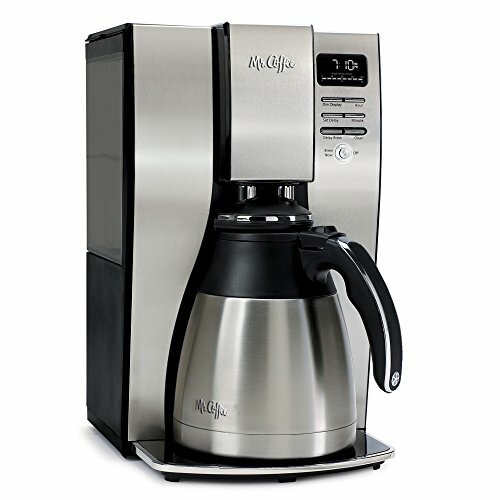 If you’re a bit of a purist (or control freak) then this pour-over coffee maker from Melitta may be a good bet for you. 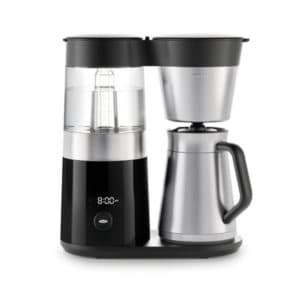 It combines the great results you get from a pour-over brew with a stylish stainless steel coffee carafe that keeps the coffee warm for a few hours without burning it. It’s a completely manual system so you need to know your stuff if you want a good result. That being said, once you get your timing and process sorted it will reward you with a better cup than you’ll get from something with a lot of dials and buttons. The carafe has a glass lining so you need to treat in gently when washing or transporting it. As long as you don’t pour boiling water into the carafe, or drop it, it’ll last ages. 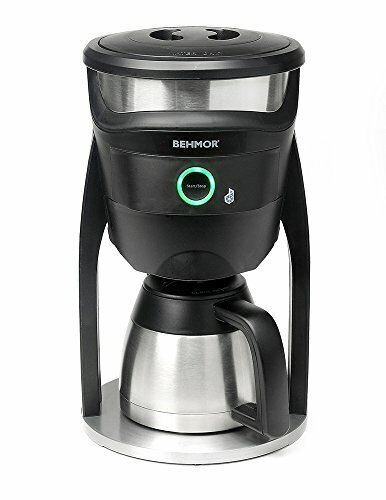 Pros: cheap, great coffee for the price (full control over grind, temperature, brew duration, etc),Filter cone is open so there’s no chance of forgetting old grounds in there and discovering a fungus farm a week later. Cons: pour-over filter is plastic but at least it’s BPA free.Completely manual. Grind, water temperature and brewing time is all up to you. It’s not going to turn out well if you don’t know what you’re doing. Water reservoir and filter on two different sides - needs clearance o​​​​​n both sides. The guys at Mr. Coffee obviously share my dim view of being patient and have made a coffee machine that brews a full pot in just 7 minutes. They claim it’s as much as 26% faster than most other machines. If you really can’t wait then just hit pause and pour a cup mid-brew before letting it get back to brewing the rest. I really liked the fully automatic experience with the ability to set the timer to get a brew going just before you wake up. If you often find all of your guests want coffee except that one cretin that insists on tea then you’ll love this coffee machine. Besides making great coffee it also provides you with hot water on demand for tea or hot cocoa. I really loved the flexibility of being able to either use the 1-4 cup option for a quick cup or brewing a full pot. The charcoal water filter is a nice touch too. Normally I filter my water separately to get rid of any odors and chlorine taste but this coffee maker will do all of that for you. You need to replace the filter after 60 uses but they’re readily available from Cuisinart. The hot water used for brewing is heated to around 200 degrees which is perfect for getting a decent brew. The carafe will keep coffee hot for hours after it has been brewed. A lot of coffee carafes are great at keeping coffee hot but terrible when it comes to pouring. 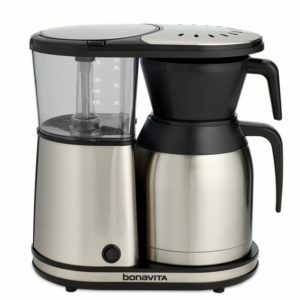 This 10-cup coffee maker does a great job of making coffee but it’s the carafe that was the standout feature for me. The thumb-activated pouring and well-designed spout means your coffee goes in the cup and not around it. I really liked that the water reservoir was removable. It removes all of the hassle and risks of pouring water over your coffee machine when refilling the tank. 2 - the carafe is double volume and vacuum sealed stainless steel. Getting that water temperature up to 200 degrees is also one of the reasons this machine makes such a good cup. 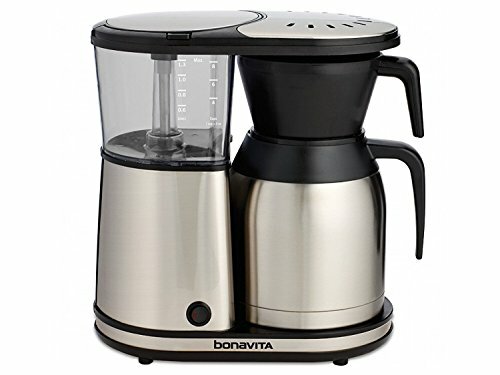 If you want a simple coffee machine that gives you consistently good coffee then the Bonavita BV1900 Coffee Maker is a great option. No gauges, no dials, no menus, just one button. Push button, brew coffee. Perfect. I’m a big fan of the pour-over method so I liked that this machine gives you the option to wet the grounds for degassing first before starting the brewing stage. Pressing the power button for a few seconds switches between this option and the brew only function. The flat-bottomed filter basket means you get better saturation and extraction than you would from a traditional cone-shaped basket. The quality of coffee that this machine produces makes it unsurprising that it has been listed on the Certified Home Brewer Program of the Specialty Coffee Association of America. No auto-stop if you want a cup before the brew is done. Wow, that grinder is loud! If you like being able to vary the strength of your coffee from day to day then the level of control this unit gives you is great. You get the simplicity of pressing one button and getting coffee while being able to tweak your grind and brew strength when you want to. 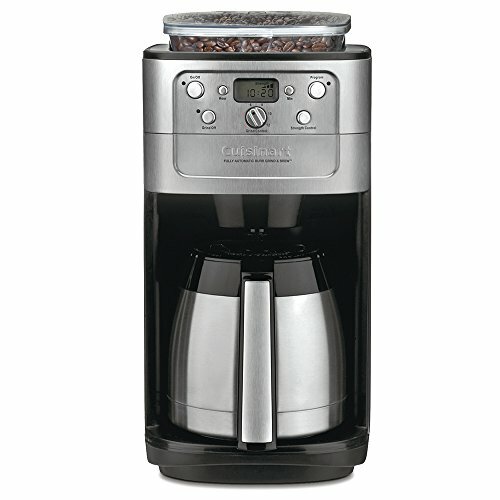 While it has a built-in grinder there is an option to turn the grinder off so that you can use ground coffee instead of beans. Even though it has plenty of buttons and settings, it’s fairly easy to use after a quick flip through the user manual. The all-in-one operation of this machine is a good feature but cleaning the individual bits does get a bit fiddly. 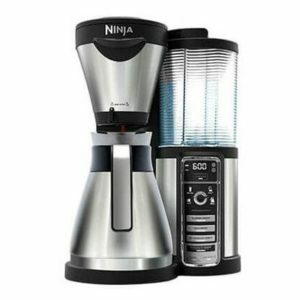 This was one of the more expensive coffee makers I reviewed but I think that the higher price tag of the Ninja Coffee Bar Brewer is completely justified. The manufacturer calls it their patent pending Flavour Extraction Technology. Essentially it means that they’ve nailed the temperature, brew time and bean quantity for each of the 3 brew types. For the amount of features it has you’d be hard pressed to find a similar machine at this price. The warming plate, for example, is a feature that many other machines don’t have. It will regulate the temperature of the coffee in the carafe without burning the coffee into bitter oblivion. The milk frother is also a great feature which saves you from having yet another appliance in your kitchen. This was probably the closest you’ll get to a proper automated pour-over coffee maker. The programmable pre-soak option allows the coffee to bloom for anywhere between 15 seconds and 4 minutes before brewing. It takes a little tweaking to get the settings just right, though. The pulsed water flow and oversized shower head ensure great saturation of the coffee and maximizes extraction. The space age appearance might make you a little nervous to push a button but it turns out that operating it is pretty simple. I really liked that you can set the brewing temperature to exactly what you wanted. 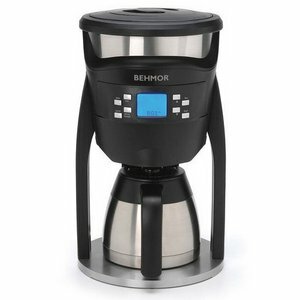 Th Behmor Brazen Plus Coffee Maker isn’t just a pretty face. The simple way it produces great coffee and the quality of construction were, no doubt, big contributors to the SCAA certification. When they use the word “Barista” in the name these guys aren’t overselling it. The amount of finesse in the brewing process is about as good as you’ll get with a trained hand. Press one button and hey presto, a perfect pour-over brew cycle. The shower head does a great job of saturating the coffee so there’s no need to give the coffee grounds a stir halfway through. It’s like having a barista in your kitchen who gets the consistency right every time. 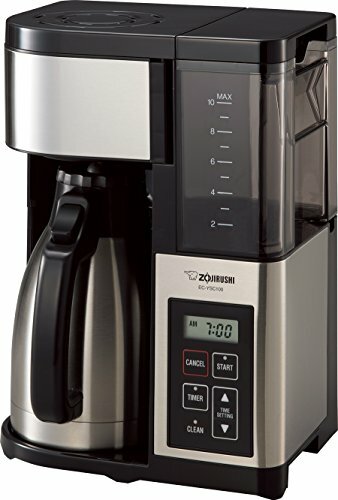 This unit is capable of brewing 9 cups but also has a single serving option that’ll fill a 10 oz mug. I would have preferred it if the steam from the brew didn’t fill the fresh water tank with condensate but that’s just about all I can complain about with OXO On Barista Brain coffee machine. I love the fact that the only thing that Technivorm make is coffee machines. Their focus has obviously paid off because this is one mean coffee maker. It’s not exactly small so you’ll need a decent space on your counter but that’s a small price to pay for the great coffee it keeps producing. The brewing cycle is carefully controlled to allow for pre-infusion and then pulsed water release at consistent 196-205 degrees. It does it really fast too. It’ll give you a ½ carafe in 4 minutes and takes only 6 minutes to give you the full 10 cups. The high-quality metal construction also sets it apart. If the 5-year warranty is anything to go by then you’ll probably be leaving this to your kids in your will. 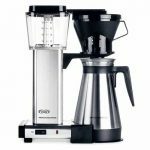 While choosing the best coffee maker with thermal carafe may not be a matter of life or death, I think that it comes pretty close. Coffee that is poorly brewed or goes cold too quickly can ruin a perfectly good day in no time. Each one of the coffee makers I reviewed above is great in its own right. The features, or the lack of features, will appeal to different people for different reasons. At it’s simplest, a manual pour-over is going to give you the best cup of coffee at the best price. This is fine if you’re into DIY coffee but not if you want to press a button and have a machine do it for you. 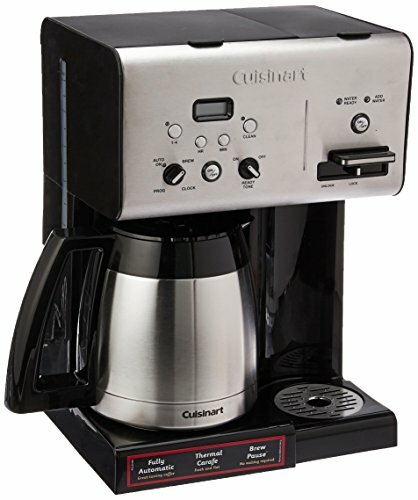 Some of the cheaper, simpler machines will give you a good cup of coffee purely by virtue of their good temperature control. If you want excellent, instead of just good, you’ll need to spend a bit more to get an intelligent machine that replicates the pour-over stages. Decide on your budget upfront as well as whether you’re fussy enough to justify the increased cost. In the end, even the greatest coffee isn’t great if it’s cold so make sure you get a unit with a decent thermal carafe. If you tick all these boxes then you’re going to have a far better start to your day. Thank you Kim for letting me know. Great straight forward information. I feel like a better educated consumer. Thank you Ronnie! That made my day!